Nagorno-Karabagh (Artsakh in Armenian) is an area within Azerbaijan populated by Armenians. A de facto government, closely allied with Armenia, declared independence in 1992. 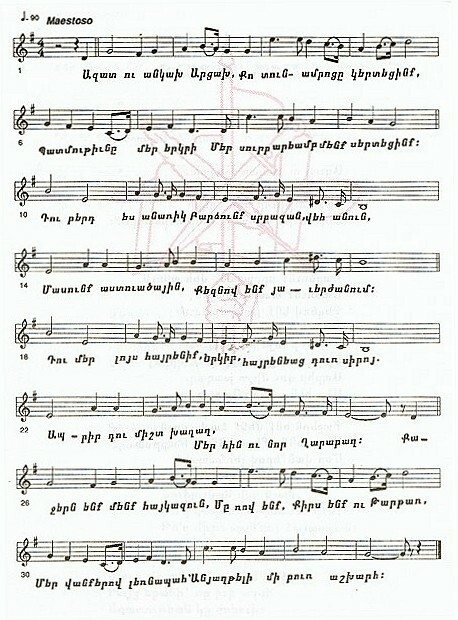 It is interesting that they have not adopted the anthem of Armenia, but instead they have an anthem of their own. Special thanks to: Pavel Zinovatny for the MIDI. Mér sourp aryamp ménk sérdétsink. Mér hin ou or gharapagh. Let peace always be in Karabagh!